On sale! 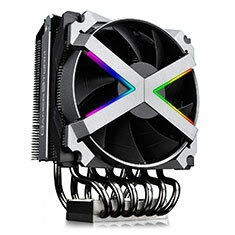 (normally $149) Fryzen is the award-winning cooler from Deepcool, specially designed for the AMD Ryzen Threadripper series processor, and supports the TR4/AM4 and mainstream AMD socket types. It features an ultra large copper base and a parallel arrangement of 6 boot-shaped heatpipes for extreme heat dissipation performance. The all-aluminium housing with inverse double-bladed fans offers twice the air pressure for twice the performance. A built-in 16.7M true colour RGB lighting system provides variable lighting for a stunning personalised gaming rig.